SoundVision Recording is in Mesa, Arizona. The facility is a quiet, creative environment combining the best analog pres & analog front end to the best digital has to offer. Full lounge with kitchen,internet & multiple TV`s each set up with game stations. 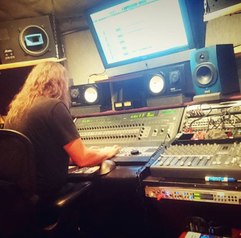 The studio often has outside producers bringing work & bands into this environment to produce or mix their releases but is primarily used as the recording environment for producer Michael Beck. Michael has worked in just about every branch of the music business. Radio DJ for several valley rock/alternative radio stations, A&R for several record companies, management, industry consultation & as a touring singer with many international releases as well as the producer/engineer for countless records. Find out more about Michael in the bio section. The newly built control room featuring a full Pro Tools system with a fully automated Focusrite Control24 console, a 12 channel SSL sidecar with API 500 box EQ from Purple,Phoenix Audio. Rack gear from Neve/Focusrite,Trident,API mic pres & EQ`s, vintage DBX compressors, & monitoring from Urei 809`s, Tannoy Reveals & of course Yamaha NS-10`s. A great selection of mics including the Manley Reference, Neumann U67, NOS Ribbon mics, a modded Oktava 52 with a RCA 77 ribbon, as well as the usual 421, 57, 609, etc. suspects. SoundVision Studios uses an HD3 Accel Pro Tools system with Aurora Lynx Mastering class A/D converters and tons of plug- ins including the Waves SSL bundle and Focusrite Liquid Mix.